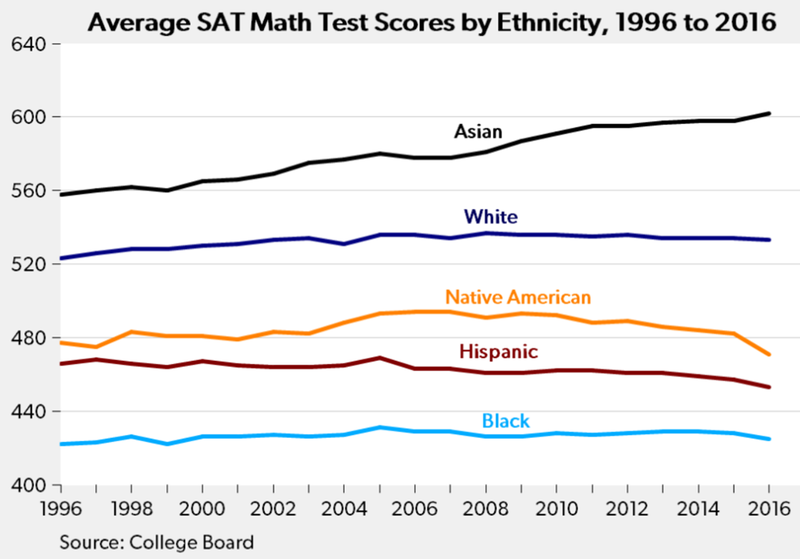 No doubt, black and Hispanic minorities are disadvantaged when SAT scores are heavily weighted, especially if the test has cultural biases as some experts contend. On average, Asian students score about 13% higher than white students … who in turn score 13% higher than Hispanics … and 20% higher than blacks. Roughly, 30% of Latino and 20% of black applicants reach the CEB performance benchmarks. So, how to make elite college opportunities available to black and Hispanic applicants? My first question: How will U of C determine which applicants are, in fact, qualified? These days, grade inflation is rampant — tending to overstate individual student’s level of achievement and blurring the differences across students. Student essays are often suspect. Many are hand-crafted by parents; some are “produced” by a cottage industry of application consultants. Research has indicated that Interviews are equivocal, at best … depending on the skill and personal biases of the interviewers. Further, schools are increasingly unwilling to report students’ class ranks … and teachers / administrators who submit references are increasing gun-shy to disclose students’ shortcomings, fearing legal challenges if confidentiality bonds are broken. So, how will U of C decide who gets in? Seems like a subjective process that is ripe for – you guessed it – bias. There’s a 2nd part to the new U of C policy that makes more sense to me. U of C is committed to giving full scholarships to admitted students whose family incomes are less than $125,000. Rather than ditching the SATs, why don’t schools like U of C hone in on the 30% of Latino and 20% of black applicants who are “certified” by the CEB performance benchmarks? I would think that full scholarships to the #3 ranked U.S. college would make be a powerful recruitment tool. This entry was posted on June 26, 2018 at 6:59 am and is filed under College Admissions, SAT - tests. You can follow any responses to this entry through the RSS 2.0 feed. You can leave a response, or trackback from your own site.